The Second World War waged around the globe from 1939 to 1945. The impact of WWII on the daily lives of Americans and Europeans cannot be overstated. As the atrocities of the Nazis raged in Europe, American men were drafted and called to war. American music of the WWII era spoke to the soldiers far from home and also to those they left behind. The Second World War changed the course of history in many ways. One of the things that changed was music…what it sounded like, how we listened to it and how intimately it touched our lives. During WWII music became personal as well as entertaining. Major technological advances such as radio and phonograph recordings took music out of the theater and into middle-class homes. Big Bands, Jazz and Swing created a new vibe that defined a generation. The Recorded Sound Archives has digitized two very special collections from the Second World War era. 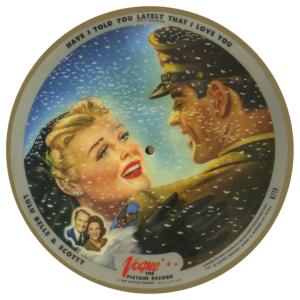 V-discs were produced between October 1943 and May 1949 by the US Armed Forces for military personnel overseas. 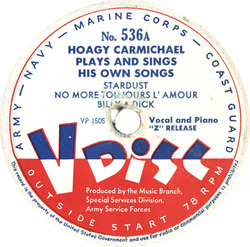 Vogue Picture Records were produced between May 1946 and April 1947 by Sav-Way Industries using a special process engineered by Tom Saffady. Enjoy the music that defined a generation – the best loved songs from the World War II era. Many thanks to all those who sent in the titles of their favorite songs from the 1940s and 1950s. Click here to listen to Songs of the Second World War. Due to copyright concerns, some recordings may be limited to 45-second snippets. Full versions are available to users of the RSA Research Station. Click here for Youtube videos. FAU events that may interest you. 2/17/15 (Tuesday) @ 5pm – FAU Wimberly Library: The Most Controversial Decision – Lecture by Wilson Miscamble. Mr. Miscamble is a prize-winning author and historian. 2/18/15 (Wednesday) @ 3:30pm – FAU Barry Kaye Auditorium: Truman’s Presidency and WWII – Lecture by David McCullough. David McCullough is is an American author, narrator, and historian. He is a two-time winner of the Pulitzer Prize and the National Book Award and is a recipient of the Presidential Medal of Freedom. 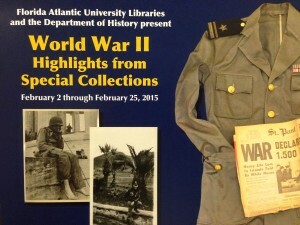 3/18/15 (Wednesday) @ 3:30 pm – FAU Wimberly Library: Nazi War Criminals, US Intelligence and the Cold War – Lecture by Dr. Norman Goda. Norman Goda received his Ph.D. from the University of North Carolina at Chapel Hill. He studies modern European history and specializes in the history of the Holocaust, war crimes trials, and twentieth century diplomacy.